Stop Press – UFO Numbers Diminish Over Cornwall. I am going great guns here. Finished Five UFOs and counting. 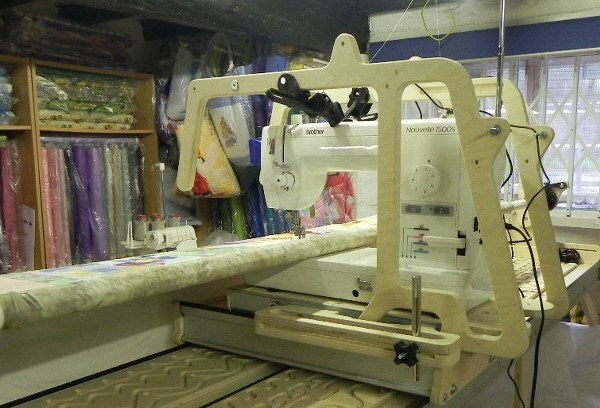 I am also getting to grips with the ‘evil machine’, the combination of quilting frame and sewing machine. I traced a couple of problems to design faults probably made worse by my refusing to upgrade the carriage I had on the frame as it was perfectly servicable. Having already laid out nearly the original price of the whole frame on a stitch regulator I didn’t really see why I had to pay out even more for a new carriage when the equipment fits the original one. 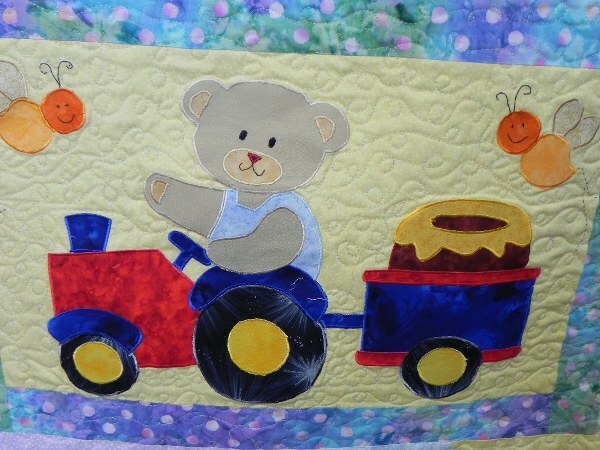 The only problem is that the wire is a bit short and I think was causing the sensor to be pulled away from the wheel and therefore stop controlling the stitch length. 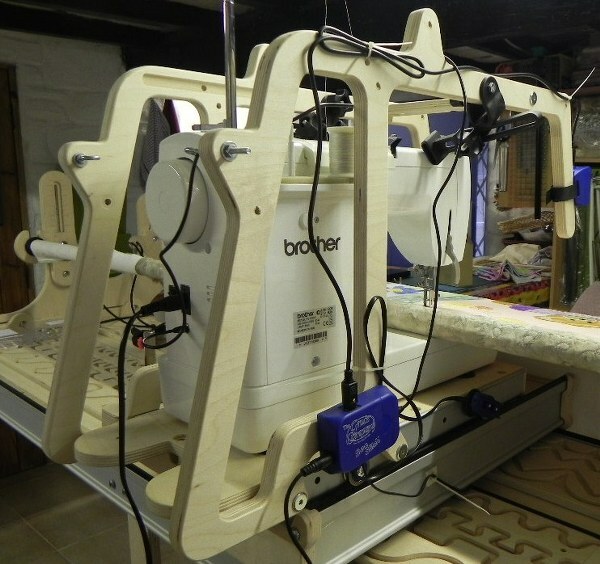 It also restricted the amount of travel available and that is serious on a none longarm setup. The Big Cheese came to the rescue (the engineering degree wasn’t wasted then) and a with a bit of judicious rearrangement of control boxes and wiring I think we have cracked it. The proof of the pudding, as they say will however be in the eating . 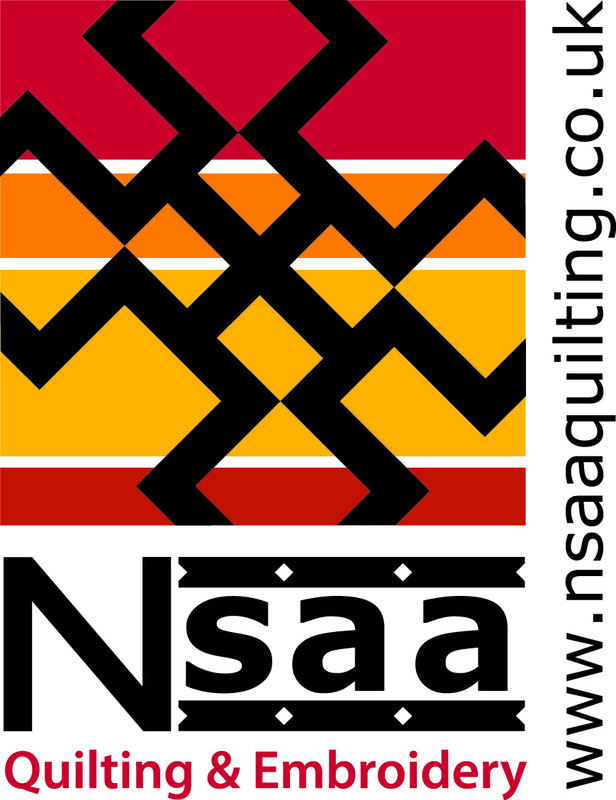 I am forcing myself to finish each quilt completely before quilting the next so I am only now rolling the new one onto the bars. If I didn’t finish each one I would just end up with a pile of UFOs in a slightly more finished state. They would still constitute UFOs. I shall be keeping my fingers crossed that the fix has worked although that could make working the carriage a bit difficult. 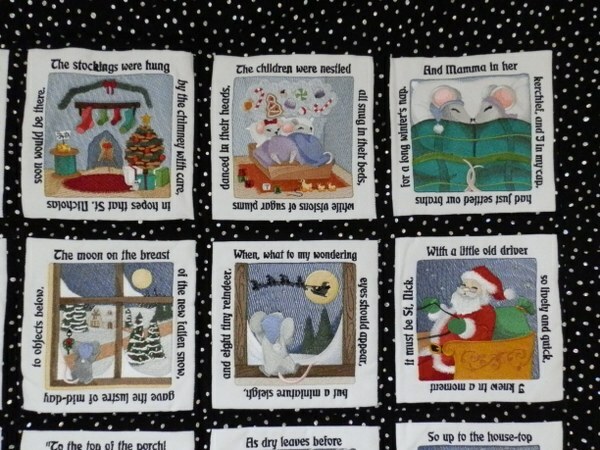 The one I have just finished is an Old Macdonald theme from a pattern by one of my favourite Australian pattern companies, Kookaburra Cottage. 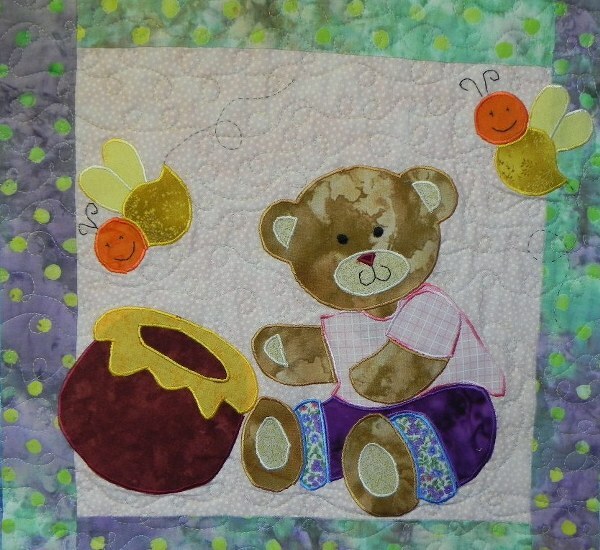 I just love a lot of their BOM projects although they do work out rather expensive if you just buy the patterns. I get over this by doing lots of each. 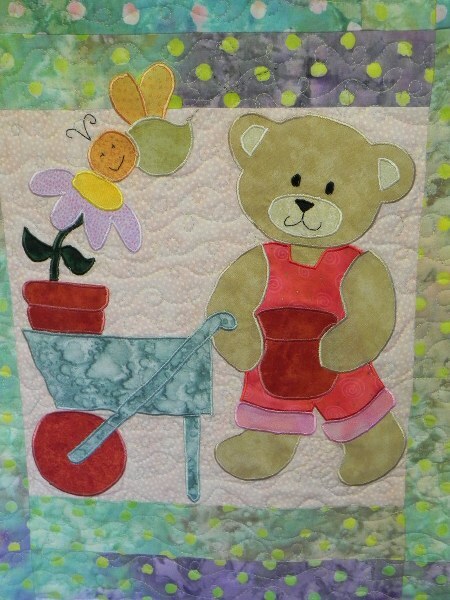 This one is ideal for a beginning applique as the pieces are all nice and big so no fiddly corners to negotiate. 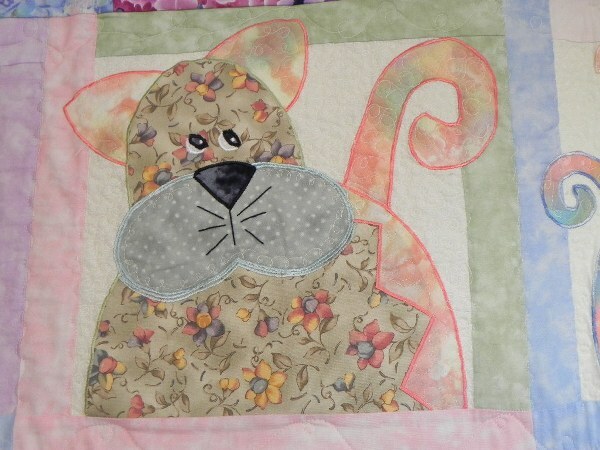 The original pattern has buttons for eyes too. I fancied a pastel version for a change. 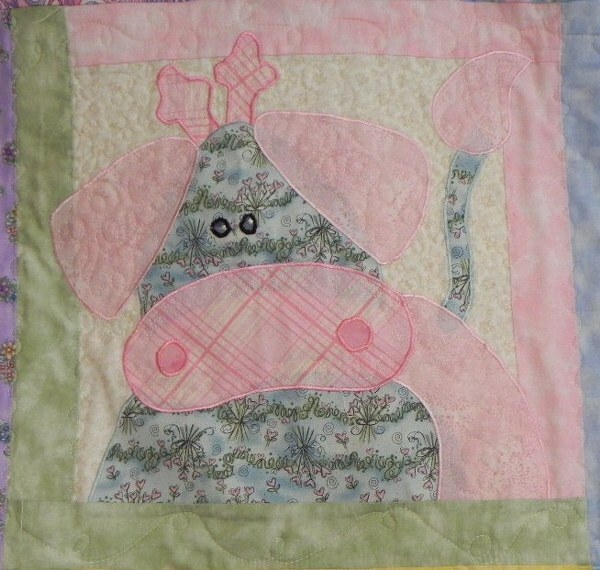 I didn’t want to do stitch in the ditch after I had finished but I like to define the blocks. I tried doing some meandering as I went along to get over this. I also did a label to match on my embroidery machine. I haven’t reached the standard I would like to but I continue to experiment and I still have a huge pile of UFOs on which to practice. Lets hope the little green men don’t arrive before I’ve finished. 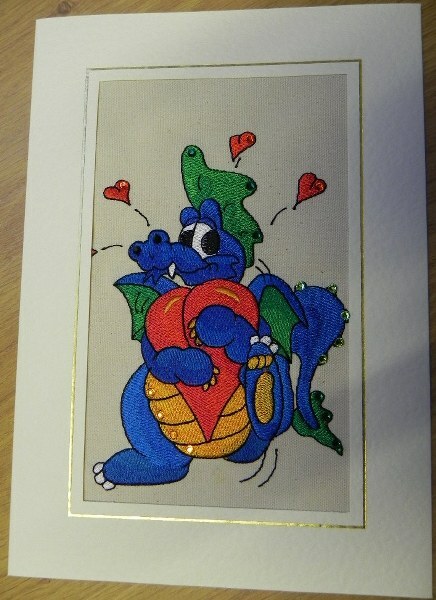 Technically my Year of the Dragon was last year. 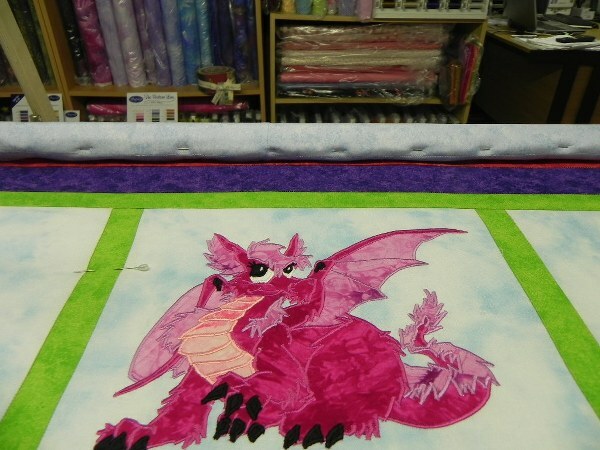 If you read my blog you will know that a part of 2011 was taken up with the making of two dragon quilts. 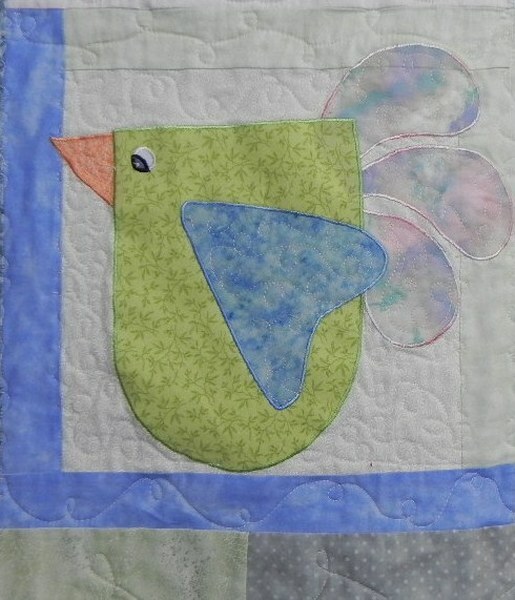 I used the applique one as a tutorial. and also and also. 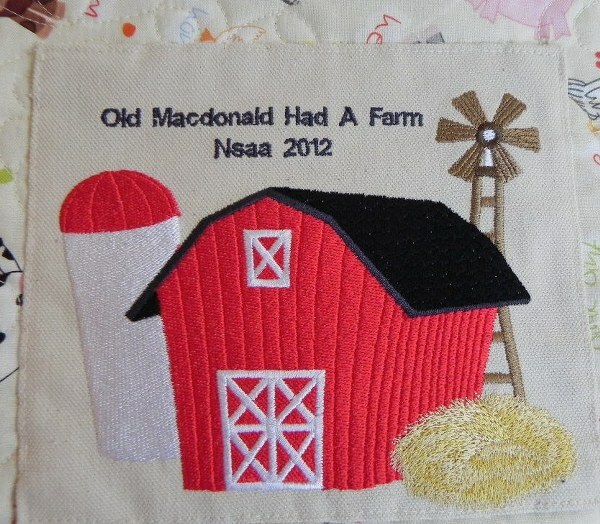 I also did an embroidered one in this post. 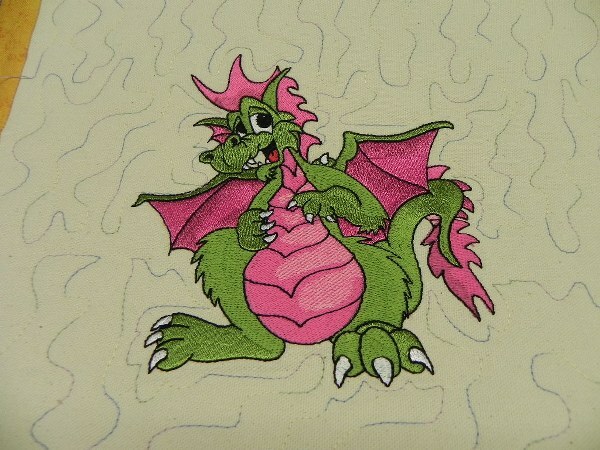 As you can see that could qualify 2011 as my dragon year. 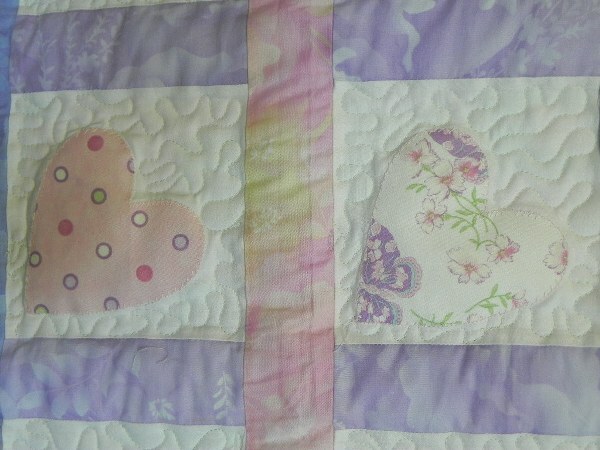 However, I am presently binding both these quilts and one of them is a present for a new baby to be born this year. 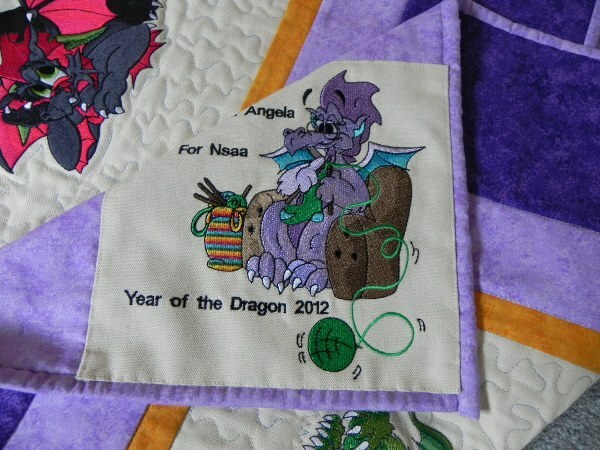 I did not know that 2012 was to be the year of the dragon but how appropriate is that. 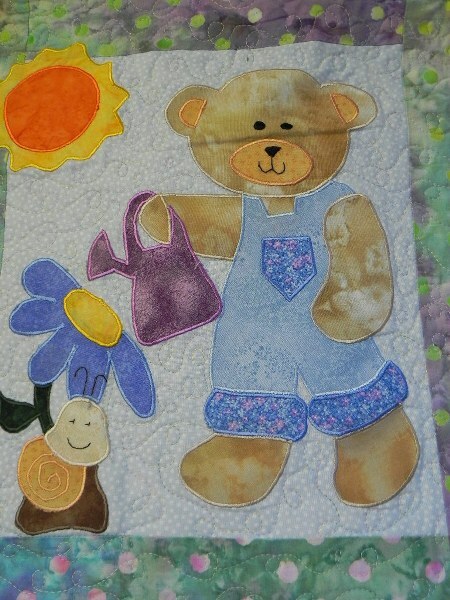 I also made a matching bag for baby katundu. 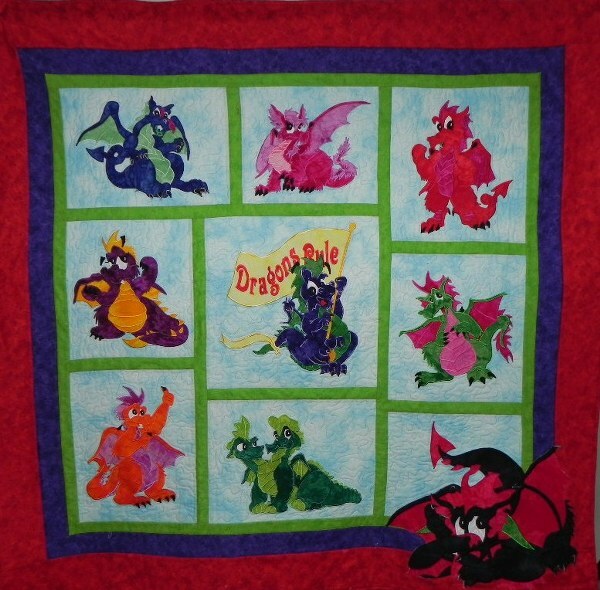 I have been struggling with my Grace frame to do the quilting but this one turned out quite well.I decided not to get too ambitious so I did a bit of random meandering round each dragon and then finished off with stitch in the ditch as it looked a bit unfinished. 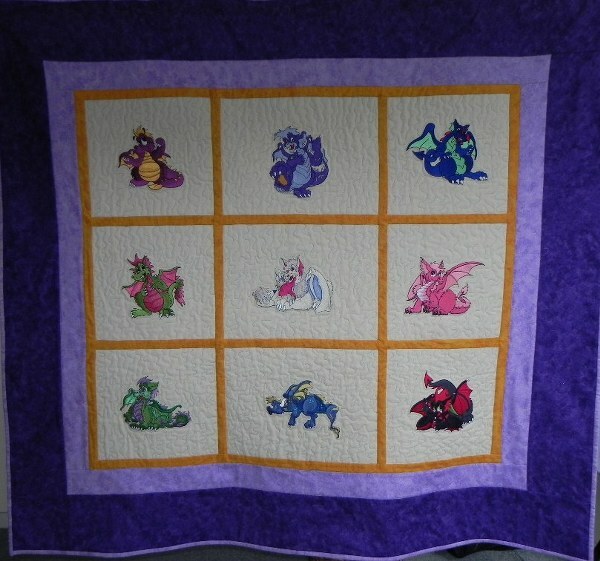 If I don’t look too hard it looks a bit like flames surrounding the dragons. 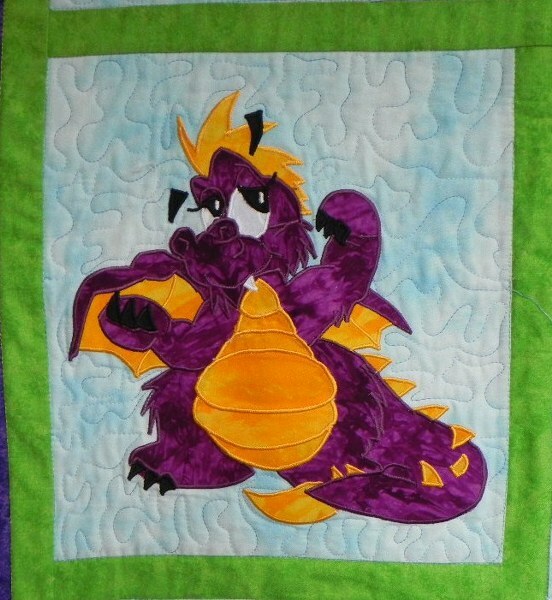 To finish it all off I made a label using one of the dragons I hadn’t used on the quilt. 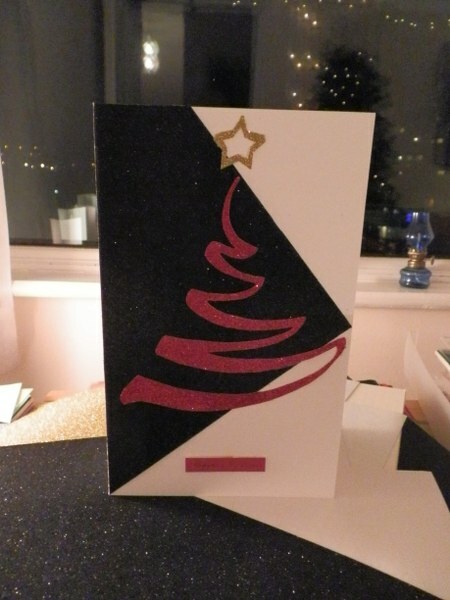 Also a card to match. If you have a Grace frame I have a few pictures to show you how it’s done. First Load the backing on to the top rail right side down. Then roll the top onto the third rail right side up. 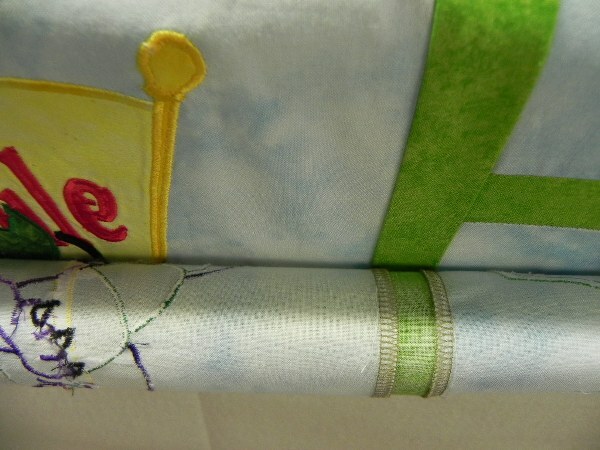 The wadding comes up between the rails and lies on top of the backing. 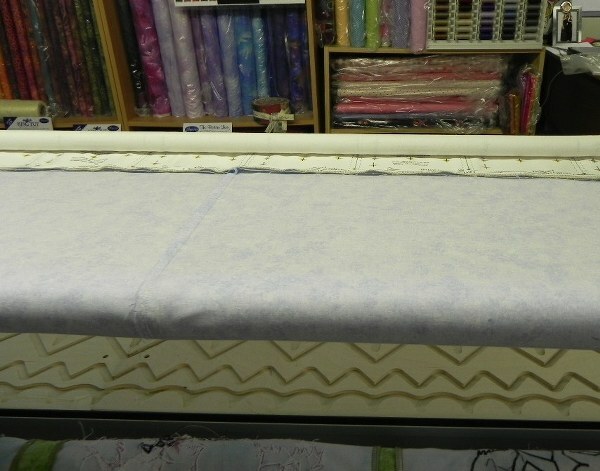 The top is then pulled up and pinned on to the wadding to be rolled on to the top rail. You now have a flat sandwich to work on. Each layer is moved on ratcheted poles. 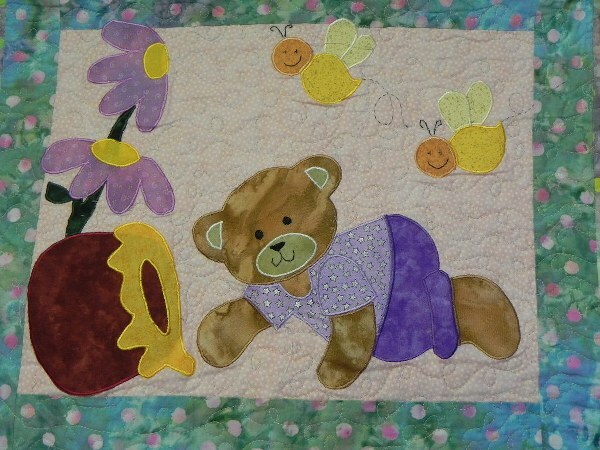 The other quilt was appliqued using a pattern from the same place as the embroideries. The Quiltery. 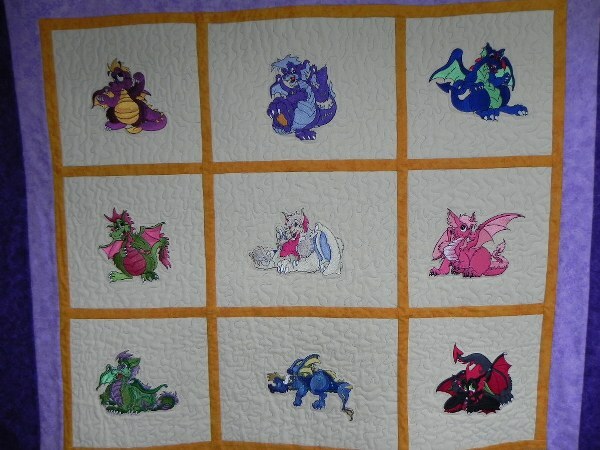 So I have finally finished the dragon quilts. Now the UFOs. 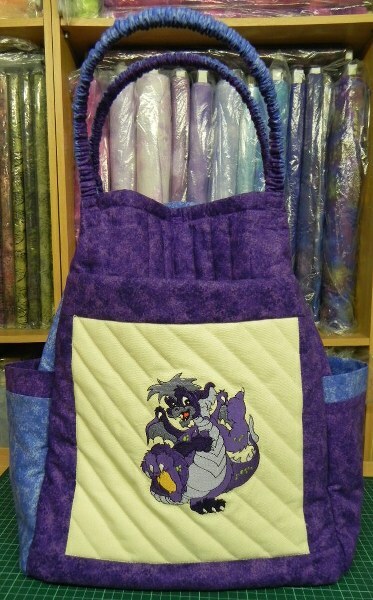 they depend on the frame and the stitch controller went haywire just before I finished for the day today. Tomorrow I have to try and sort it out. Happy days. Don’t you just love technology. It’s been a bit blustery the last few days. I forewent the walk yesterday and did the housework. Cleaned from top to bottom – and believe me this is a big house. At least it now means I can get down to what I want to do for a few days without feeling there is something I should be doing. Just in case I should think I might actually do what I wanted, The Big Cheese decided that today was the day we would wash the boat. Sensibly one would think that the time to wash a boat was when it was first removed from the water. That would have been in October. What went wrong you might ask. It has all got to do with location and weather. If location is the most important reason for buying a house let’s hope it isn’t for renting a garage. The boat shares a garage with the car when not in the harbour. The garage is a long way along a winding single track back road from the main road. The main road is accessible up a very steep and winding hill. The weather has to be right – no point in washing the thing and its getting splashed with muddy road water on the way back. Also the car wash has been known to ice up at the first sign of frost. Last year there were some very dirty cars round our way. Thus I found myself sitting in the passenger seat of a car towing a boat. You have to know at this point that I don’t do towing boats nor do I do winding roads. Combine the two and I could be a gibbering wreck, however I do what I am told. I coped quite well especially considering I discovered I wasn’t just a bystander. I was supposed to sponge the blessed thing off as it was washed. 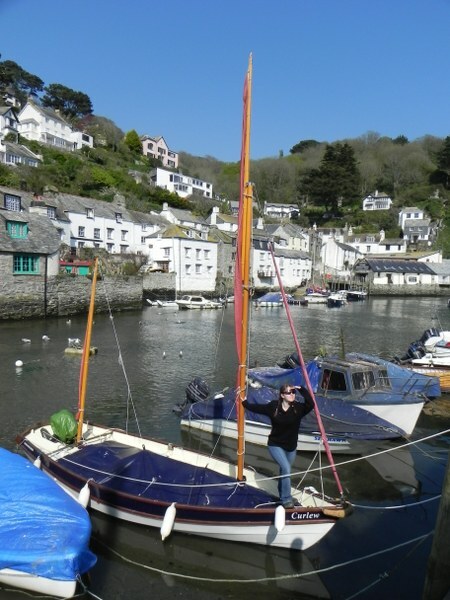 Apart from a contretempt with the bilge pump that resulted in wet trousers I think I performed reasonably competently. More than I can say for an old gentleman who managed to dismantle a section of the automatic car wash and the front wing of his car in front of us by forgetting what gear it was in. Even The Big Cheese had a moment of frolicking fun doing a cartoon skid across the wet decks and ending up in a most inelegant position in the aft section. He always did know how to enjoy himself. Mind you talking about enjoying oneself, we could have had a night out on the amount of pounds fed into the machine. We got back without any further adventures apart from meeting a couple of cars on the back road and manouevering the boat back into the garage in a way in which the car could still be accommodated. Not an easy task although truth to tell I did more directing than manouevering. I’m not sure I will be able to move my arms tomorrow but at least the ordeal is over for a year. Here is the boat in case you are into that sort of thing. 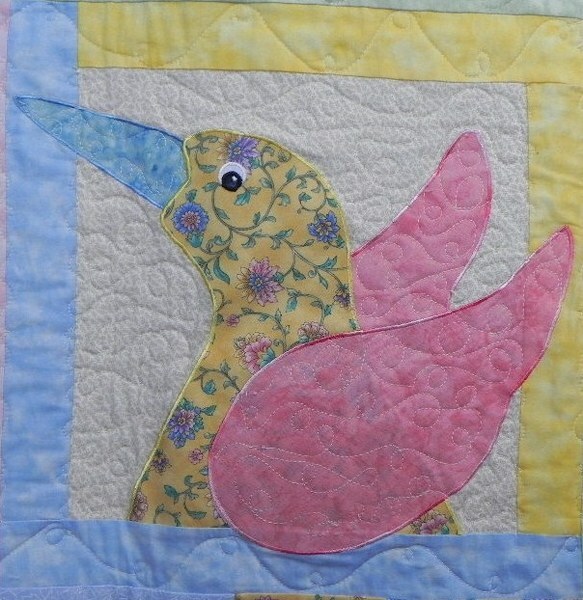 However, back to the quilting. Truth to tell I am waiting for wadding. 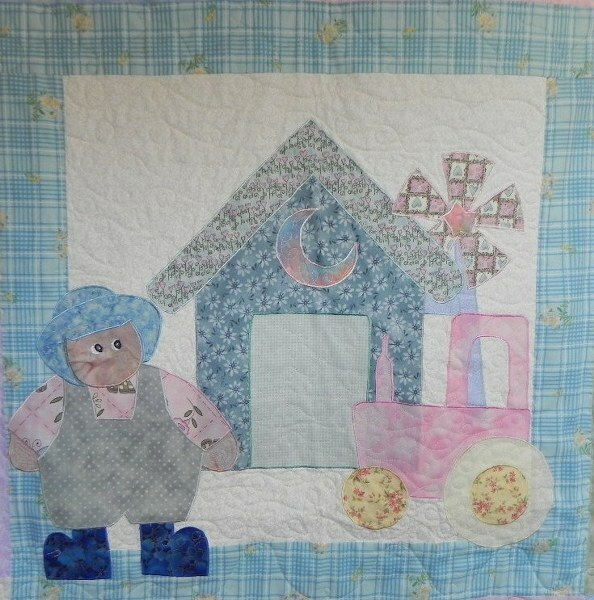 I finished two quilts on my frame last week. 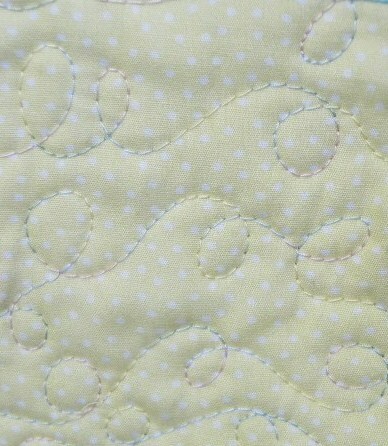 The quilting looked OK on the front but I am struggling to get the stitching on the back as good as on the front. 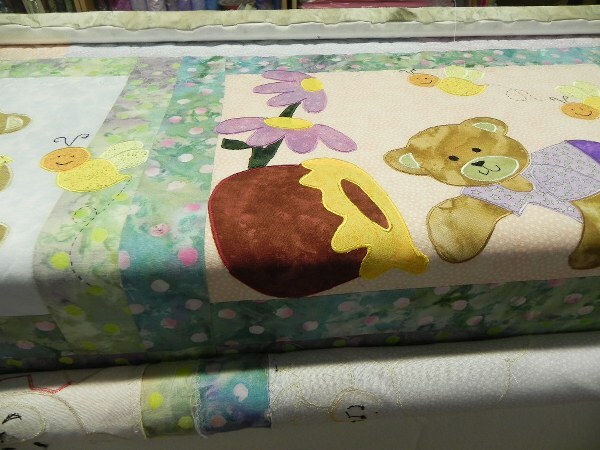 The problem is, of course that I can’t see the back until the quilting is done and rolled on to the next section. It is all very frustrating. I guess the stitch regulator will only work at a very consistent speed. If I go faster in one section the control can’t keep up and the tension suffers. Maybe number three will reveal the trick. If I don’t get the hang of it soon I may get disillusioned which won’t be a first with this frame. Hopefully the wadding will arrive in the next few days so that I can test the theory. 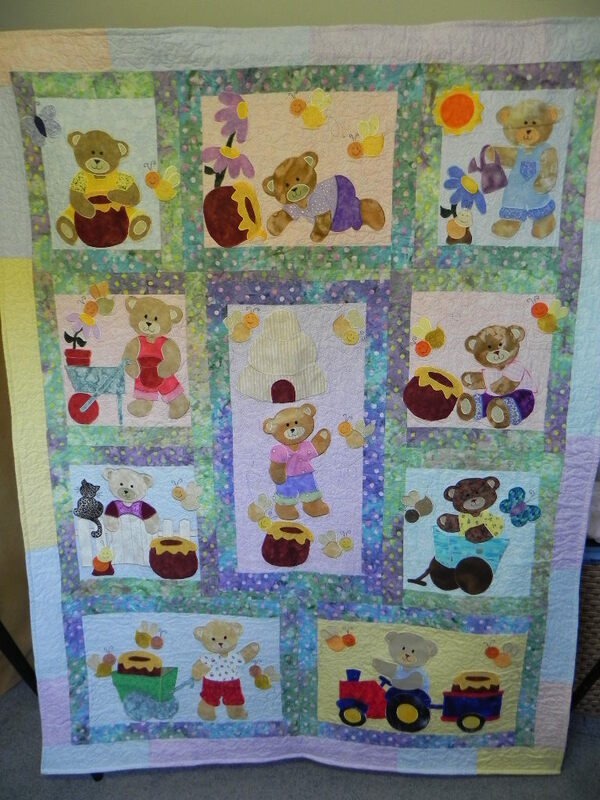 I have the next quilt on the frame ready just to add the wadding and pull the top over and pin it. I am slowly working through my pile of OFOs. With most people this would be a manageable number. Would that ’twere so with me. 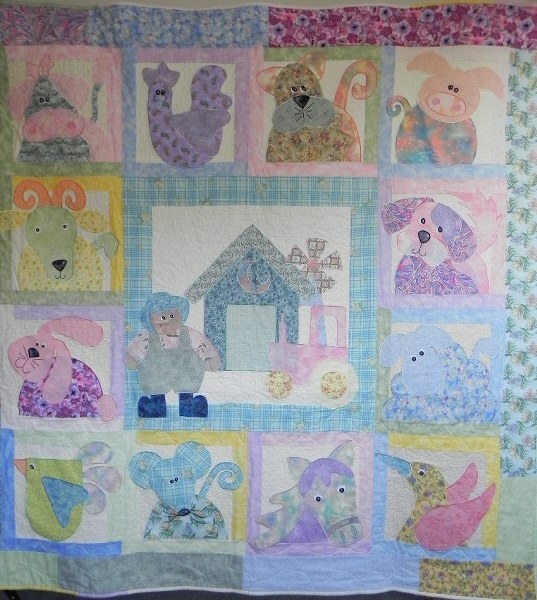 I spent many years overseas, sewing prolifically but not being able to finish quilts as they would have taken up too much room in the suitcase. As a result I have many. That is why I have to conquer the frame. 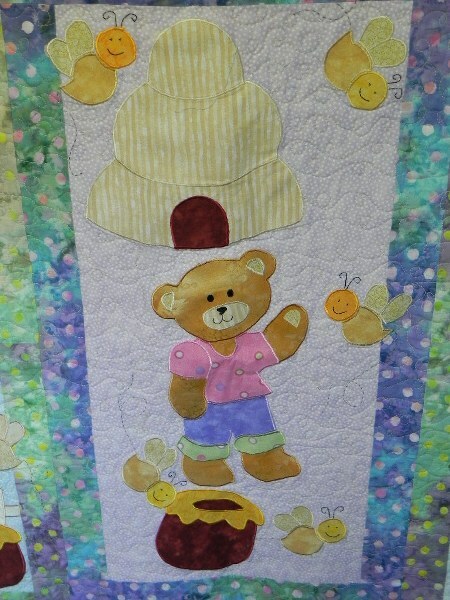 My second attempt was a quilt from kidsquilts. 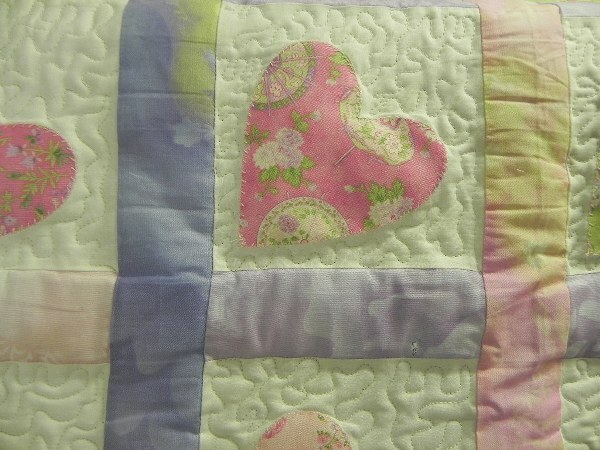 The quilting does finish it off and if I discover the secret to the perfect back I will share it with you. Now if I can get the back to look like that I will be happy. 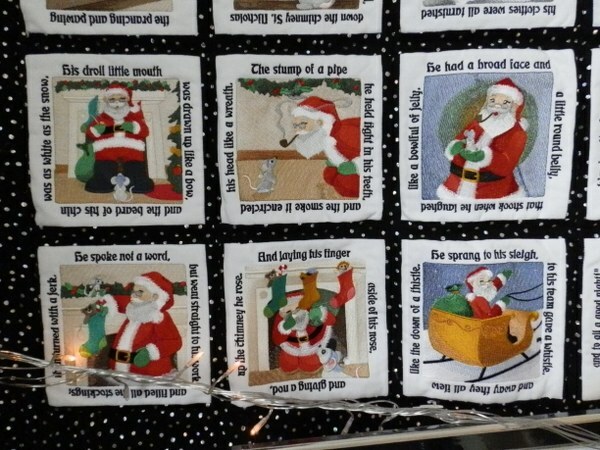 Here are some close-ups of each panel. 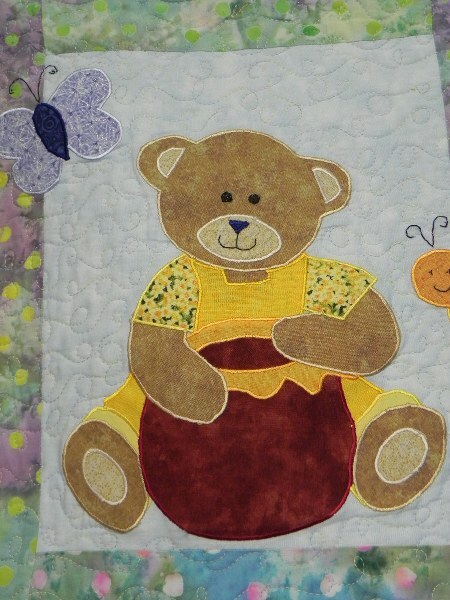 Don’t look too closely at the satin stitch, it was a long time ago and we all have to start somewhere. It is a very good way to use up all the small pieces you have been saving for you didn’t know what. This one with the gate is my favourite. 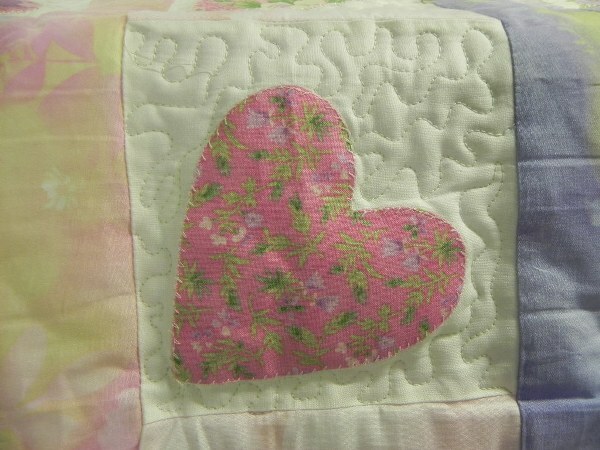 In case you don’t feel up to doing anything as detailed but like the idea of applique, this hearts quilt is easy to do. 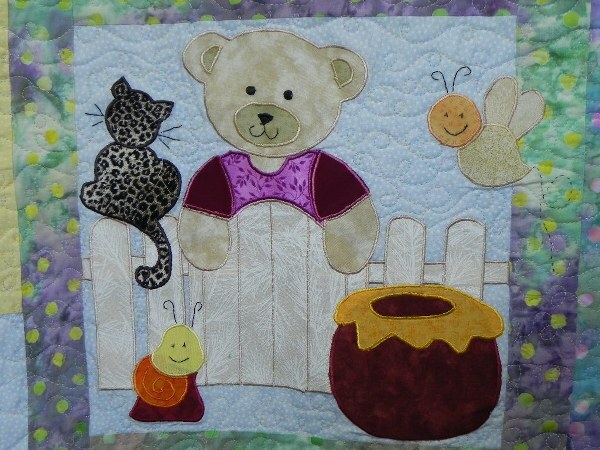 I used a set of charm squares and an embroidery stitch from my machine. 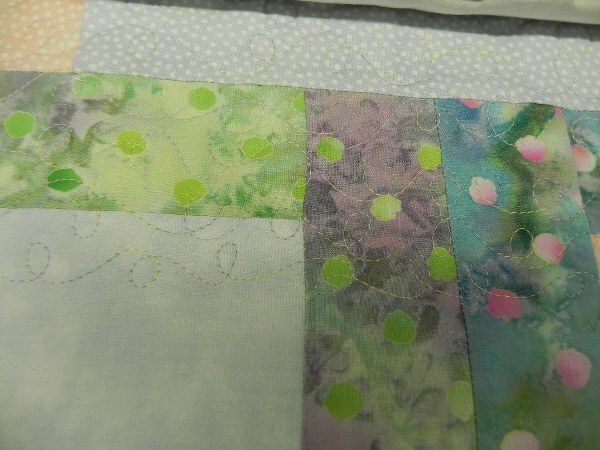 I then quilted using an all over meander as a way to get used to the machine on the frame. This was the first one I tackled. I will be persevering with the frame and will let you know how I get on. Maybe I will come up with a few tips that I can pass on. I’ve Been Framed – Tip the Fifth. 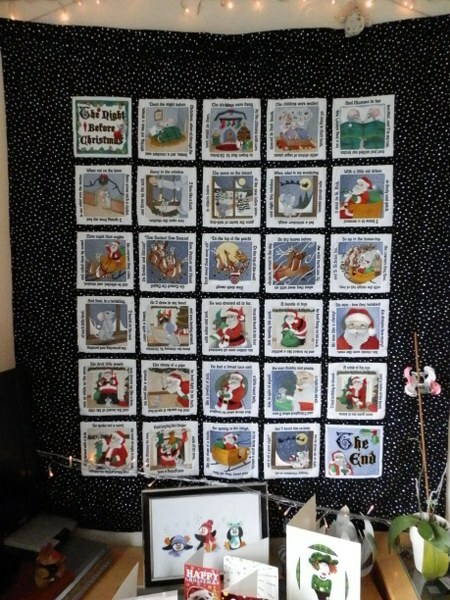 I finally bit the bullet and used my quilting frame. If you have been following the blogs you may have gathered that I bought a Grace frame and Brother mid-arm some years ago but have used them very little. A combination of disappointment at the results and a very low ceiling and narrow room finished my enthusiasm. I struggled to move round the frame and as I could not raise it high for fear of hitting the beams, I couldn’t even see what I was stitching unless I sat down. Also hitting my head on the sloping ceiling was a given and speeding up and down the frame on a wheeled chair was not really to be recommended. Funnily enough, when I went on a course to learn the tricks and tips, I found I was the only one having that difficulty. 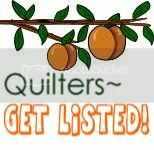 Was it a coincidence or are all quilters petite? If so this could be why I failed – genetics. To be perfectly honest the designs it is possible to produce on this frame are also a bit limited. 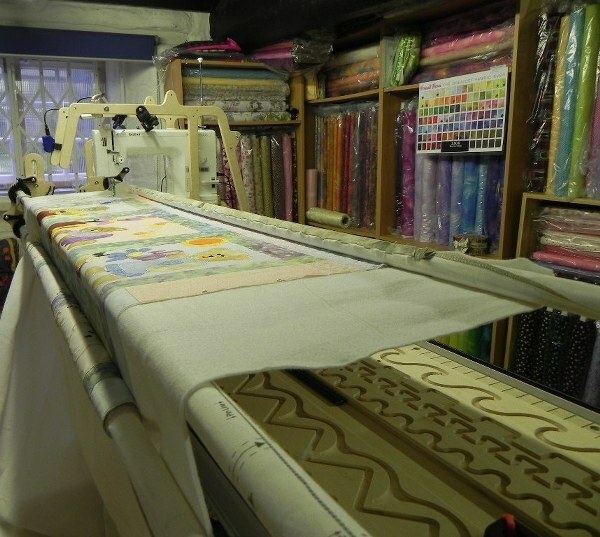 If you are quilting a large quilt the throat space will gradually reduce as it rolls round the top rail until, if it is large enough it will be impossible to do anything. Luckily I don’t do anything too large, although even the single bed size I have on the frame at the moment may yet prove to be a challenge. 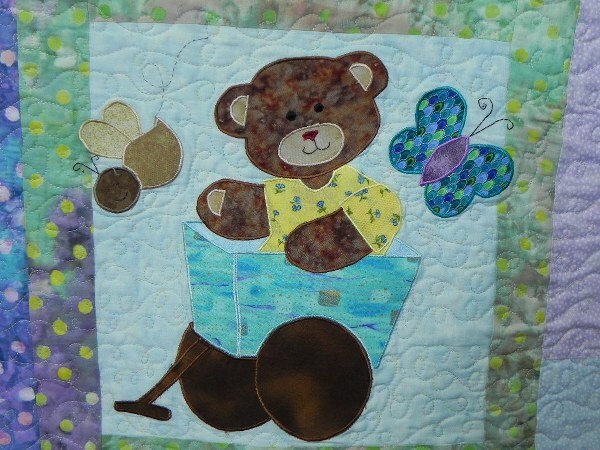 The secret is to choose a pattern that does not require a large area at once or break up the pattern into thinner segments. 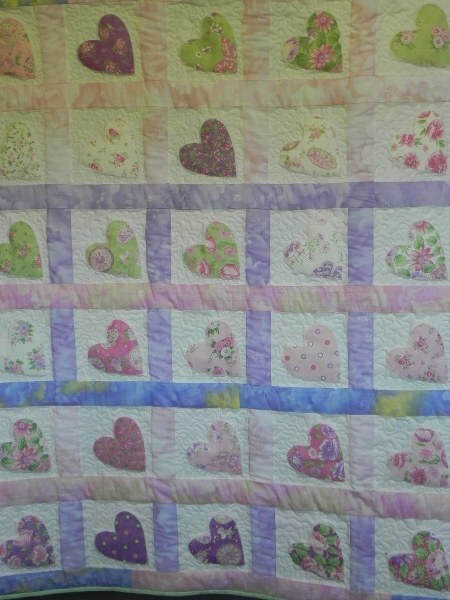 I dare say that eventually I will come to know how big a pattern is possible on a particular size of quilt. 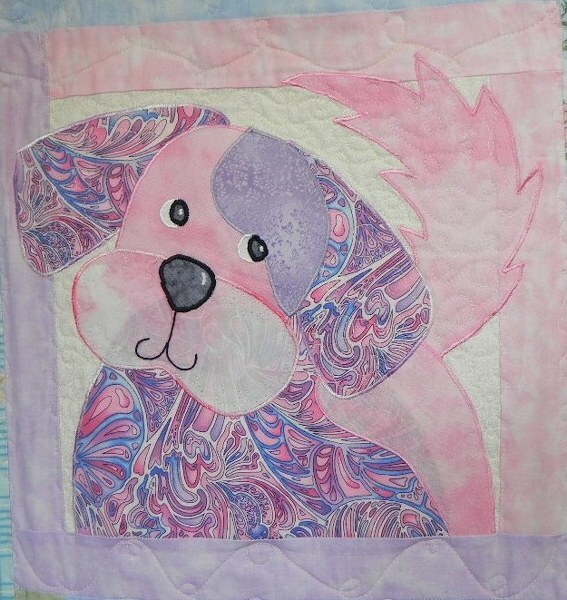 Anyway, as I said, I finally got back to quilting on the frame. The first thing to do was move it to a bigger area. The ceiling is slightly higher and flat which helps and so I can raise the legs to the highest setting. There is no doubt about it you need a lot of room. 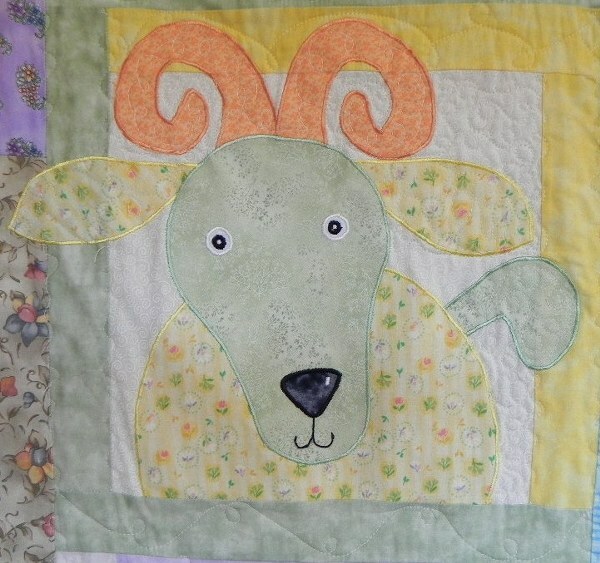 I think I may actually enjoy the quilting and the finished quilt so maybe I will work out some of the idiosyncracies and conquer all. 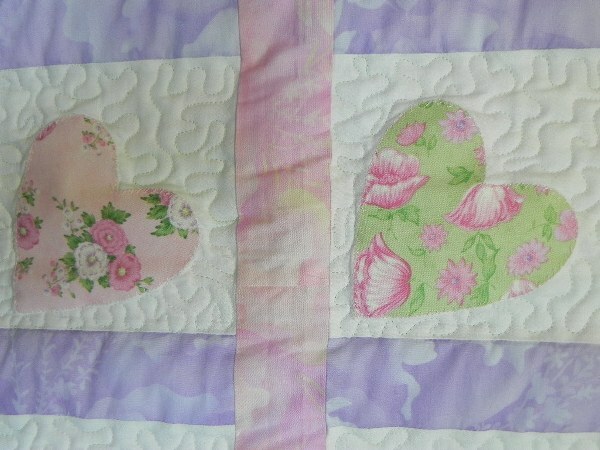 Here is a picture of a bit of the first practice quilt I did. I gave a whole load of unfinished tops to Project Linus but I kept a few back to practise on and will pass those on later. As you can see, a lot of random meandering. Random meandering is about the safest thing to tackle but it looks pretty. 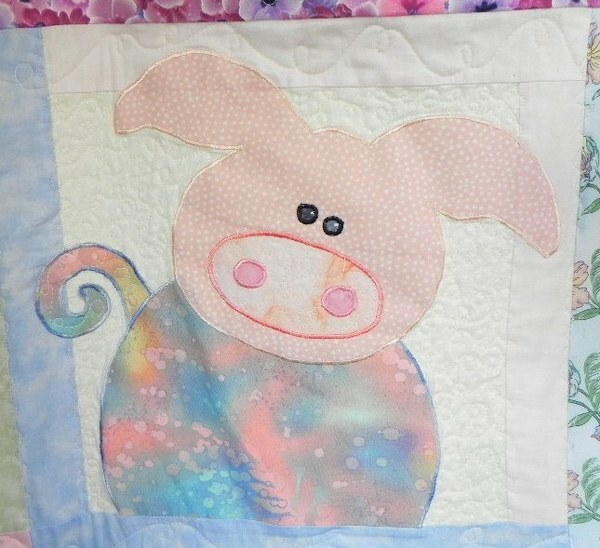 I would usually stitch in the ditch for a quilt like this, mainly because I have no chance of hoiking a large quilt under the throat of my machine and quilting it successfully. The frame gets over this problem although stitch in the ditch could be a challenge. The other problem I had originally was that the needle was still controlled from a foot pedal. This was mounted on a platform on the top of the carriage carrying the machine. There was a levered contraption that pressed on the pedal when the lever was squeezed. Even before my right hand started protesting about overuse this was very difficult to control. Now I wouldn’t even be able to squeeze the handle. The pedal would be on top at the back with a lever going along the handle line. 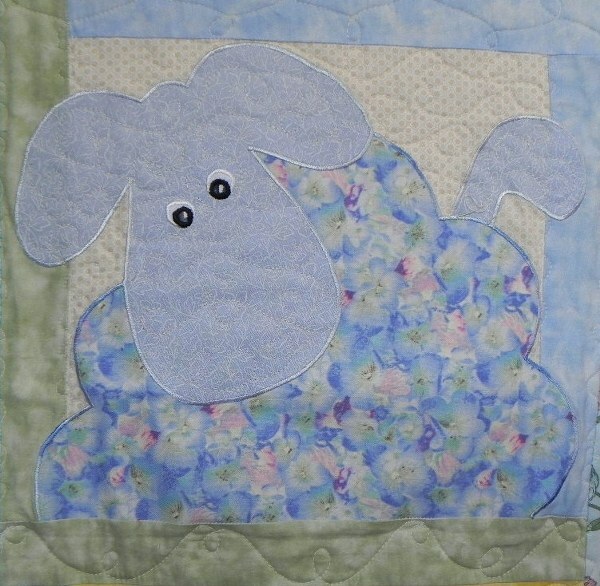 When I went on a course at The Cotton Patch I was introduced to the stitch regulator. 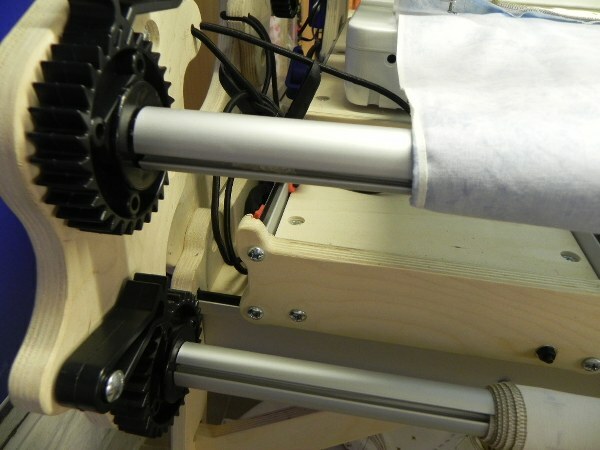 This is a clever little gizmo that allows control of the meandering purely by movement. 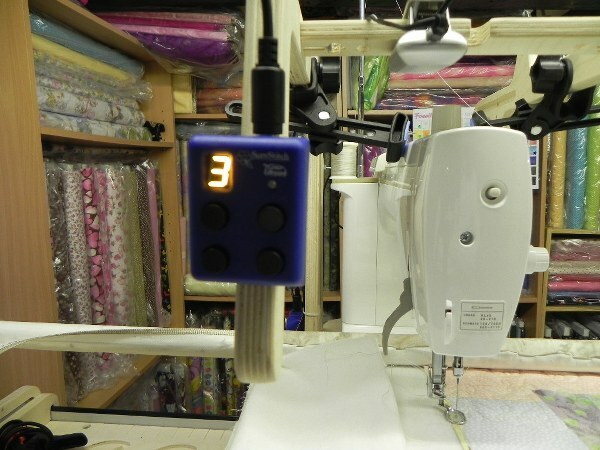 The needle is controlled from a switch box for choosing stitch length and turning on and off. 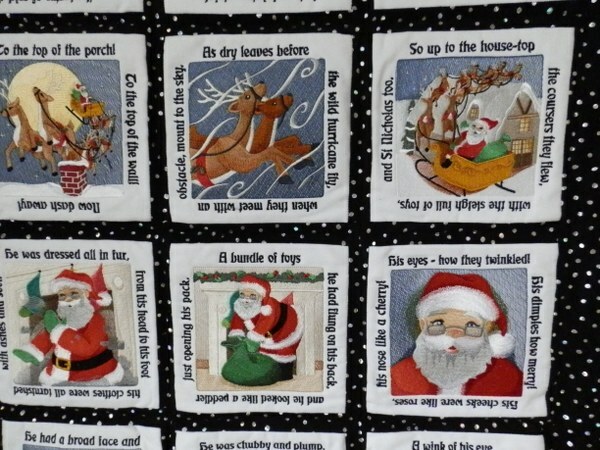 Do not be fooled, unlike a sewing machine the bigger the number the smaller the stitch. 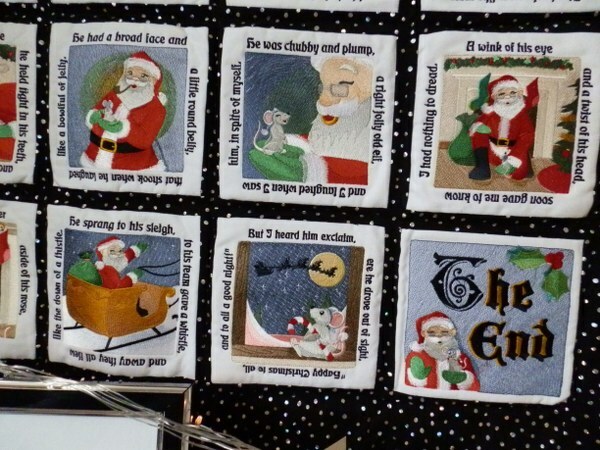 This is not stitch length so much as stitches per inch. It is not exactly that as it depends on your machine but that is the idea. This is wired into a control box that does the clever stuff. There are two controllers, one on the top carriage and one on the bottom. These monitor the speed and movement and are supposed to regulate stitch length. They do to a certain extent but at the moment it is not foolproof. 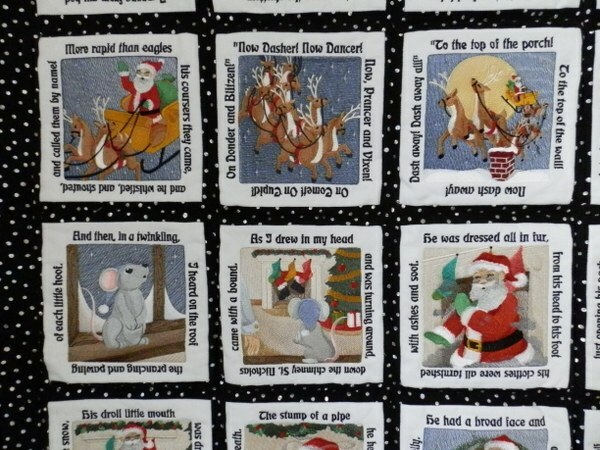 I suspect even travel at the same speed over the quilt is the secret. I am hoping that will come with time. Don’t be put off by the amount of wiring. One day I will tidy it all up and make it neat. The Big Cheese tells me it is a very clever piece of kit. That would be when I was bemoaning the price. However, I did save a bit by discovering I didn’t need to upgrade to a newer carriage as I had thought. 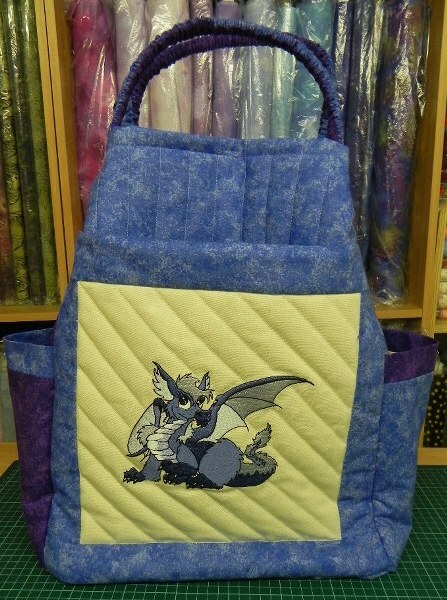 The new one is probably lighter but then considering the main weight is the sewing machine, this is not too relevant. 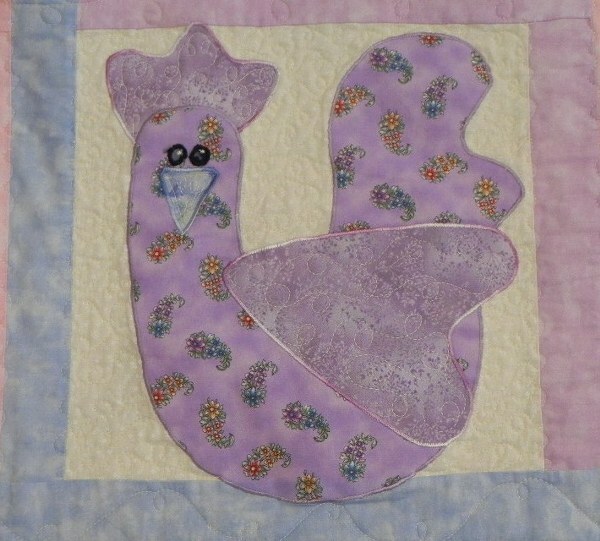 I have progressed to all-over meandering on a larger quilt. How exciting is that. 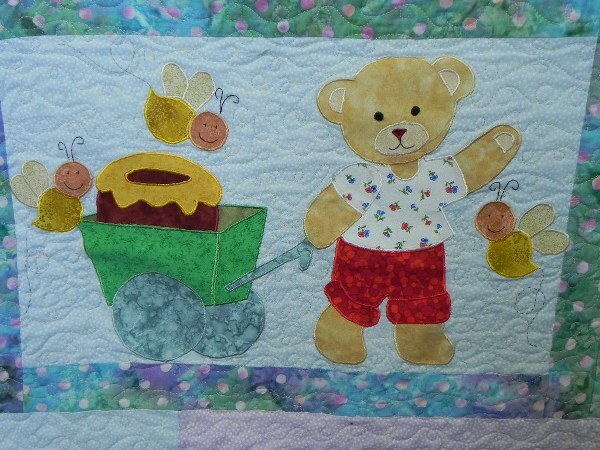 Here is a picture of the quilt attached to the machine. This is another future Linus I think. 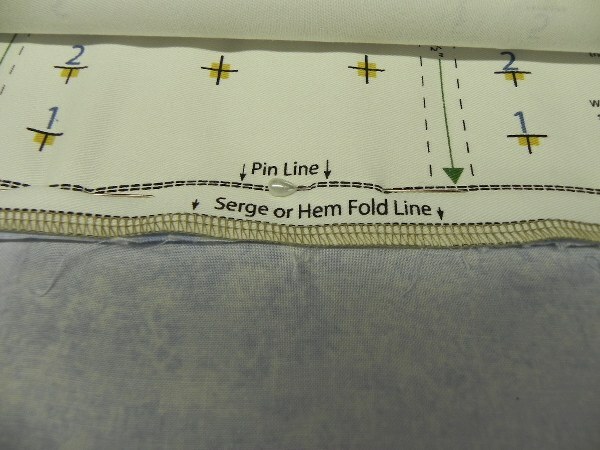 One of the suggestions on the course was to stitch down each side as you go, so holding the sandwich in place. 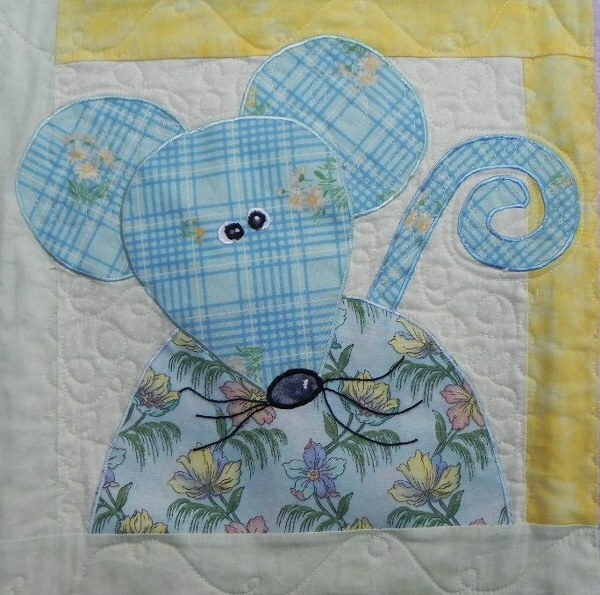 I have decided not to do that as quilting moves layers and I can see it could become a problem and cause puckering. 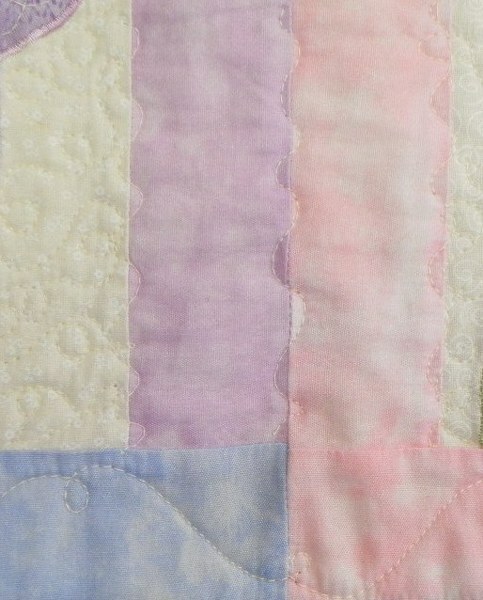 If you want trouble free quilting you might do better to stick to the thinner waddings too. ‘Dream Blend’ was recommended on the course and it seems better in use than the thicker ‘Dream Puff’ I tried to use at first. Experiment. experiment as with all my tips I recommend you try out ways of doing things, practise and see what suits you best. 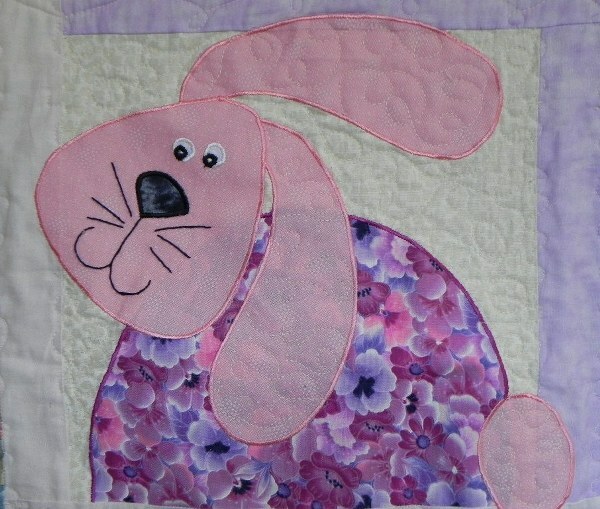 All in all I think I may enjoy getting back to the quilting. To be honest I should get good at it as I can’t do much else until I have cleared the pile of tops so that I can move the frame. Where to I am not at the moment sure. If you have a frame in the cupboard get it out and try it. You may have to rent an industrial space to use it but it’s not as scary as it looks. In case you were wondering what happened to The Big Cheese and his big cheeses here is a peek at what remained on Christmas Day by the time I managed to get a photograph. 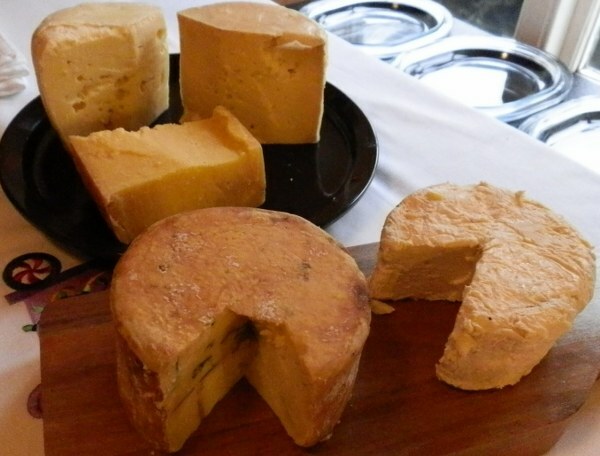 They have all been maturing away for several months and certainly all have a kick. Must be the unpasteurised milk. Gouda, Gruyere, Cheddar, Stilton and Gorgonzola. 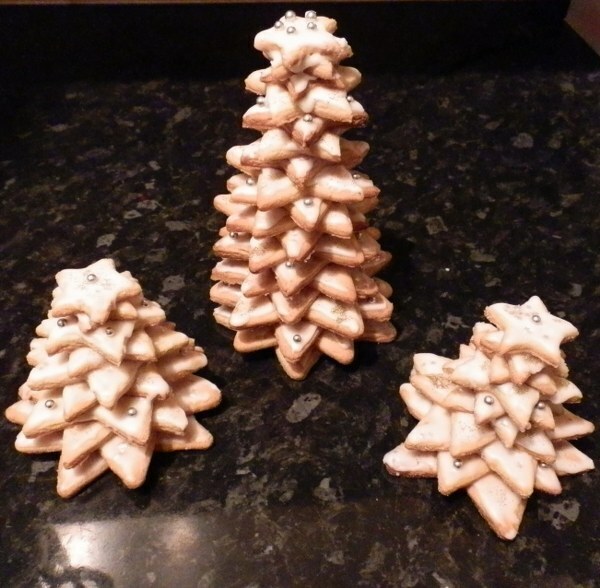 Still on the subject of food, Number One Daughter made star biscuit christmas trees for some of her work colleagues. Could be an inspiration if you are stuck for an idea for next year. The edible glitter doesn’t show up on the photographs but was very impressive. 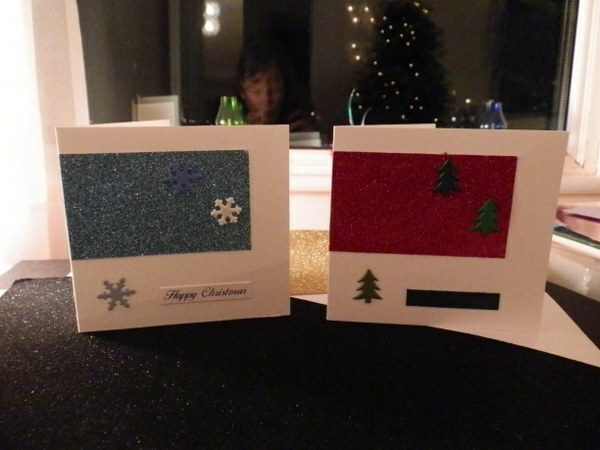 She also made some cards. 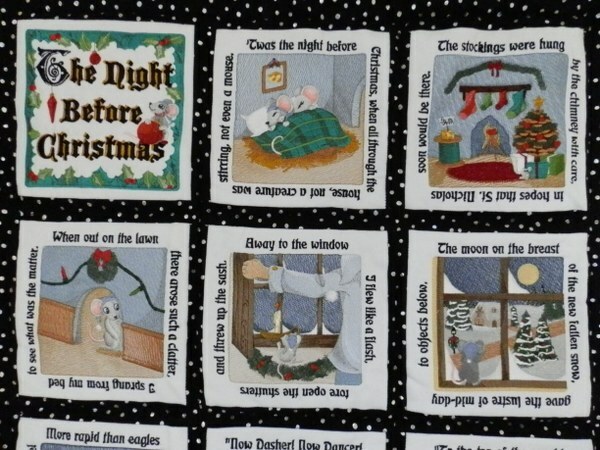 Just in case you thought my trunk full of old projects was empty I took some photographs of a ‘Night Before Christmas’ quilt I made a couple of years ago. 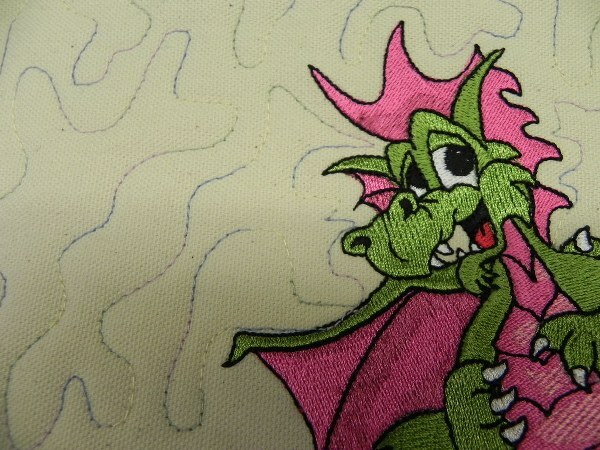 It took a very long time to do the embroideries but the rest was fairly straight forward. An heirloom I think. To round off the year we dressed up for New Year’s Eve. 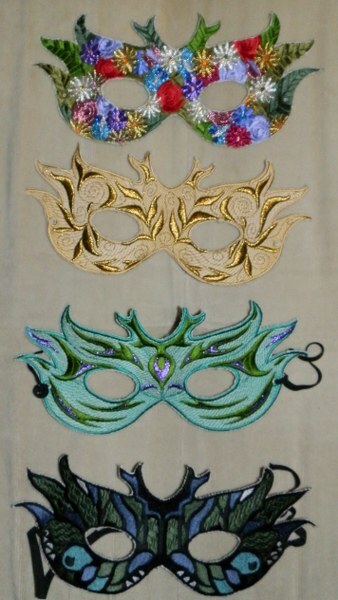 Daughter Number One embroidered masks as a token to fancy dress. She used quite a few metallics in tribute to the occasion. Our village embraces fancy dress every New Year so if you go out dressed normally you feel out of place. The sad thing is that wearing ball gowns with the addition of a mask was enough to count as fancy dress. Sad times. My New Years Resolution is to finish my UFOs. I’ll keep you posted on the progress.